Led by All-State talent Adiya Jones, last season’s Lady Hawks team went a perfect (19-0) in the regular season, winning those games with an astoundingly high 30-point average margin of victory, and made it all the way to the State tournament. That team finished with a (23-3) overall record as they rewrote the Heritage history books. Fast forward nine months and the Lady Hawks are looking to replicate that same level of success in the upcoming season. Gone now are Adiya, Michelle Iukes, Desirae Williams, and Kaenishia Herrera who all graduated, but remaining are talented seniors Aliya Jones, Myrna Redleaf, and Cyena Fryberg. Along with stand-out junior Keryn Parks and a bunch of new faces who intend on being key contributors, the expectations remain high for the Lady Hawks basketball program. On Monday, November 28, the Lady Hawks returned to action as they hosted the Marysville Getchell Chargers c-team in the 2016-2017 season opener. It’s worth noting two Tulalip tribal members play on the Chargers c-team, freshman Jasmin McLean and sophomore Kecia Zackuse. From the opening tip it was obvious that it wasn’t a question of if the Lady Hawks would win, it was only a question of by how much. The Chargers c-team is comprised of all freshman and sophomore players who are still learning to play the game, while the Lady Hawks have players with years of experience and are coming off a State run. It couldn’t have been gone any better as the Lady Hawks opened up the game hitting their first six shots and taking a 12-0 lead before the Chargers called a timeout. Following the timeout, the home team continued to hit shots and execute their offense, while playing stifling defense. At the end of the 1st quarter Tulalip led 24-0. In the 2nd quarter, the game continued to be all Lady Hawks. In fact, Tulalip led 48-0 at one point before the Chargers made their first basket of the game with only nine seconds to go in the half. At halftime the Lady Hawks were up 48-2. With the victory already well secured, Keryn got the home crowd going with a one-woman scoring demonstration to open the 3rd quarter. In what seemed like only a matter of seconds, she scored back-to-back-to-back-to-back buckets giving her team a 57-2 lead. After hitting the bench for a quick breather, the hot-handed Keryn returned to score two more buckets, making it six straight shots without a miss for her. Going into the 4th quarter, Tulalip led 61-2. Even in a blowout of this nature there is valuable experience to be had. All the new faces on the Lady Hawks were able to get a lot of run and get familiar with running the team sets in real game action. When the final game buzzer sounded, Tulalip had won their season opener 74-6. In the process they set team records with the 68-point margin of victory and a team total 34 turnovers forced, including a record breaking 31 steals. Keryn led all players with 19-points and 7-assists. Adding to the awesome game notes was every Lady Hawk player scoring at least 4-points. Not a bad way to start the season. 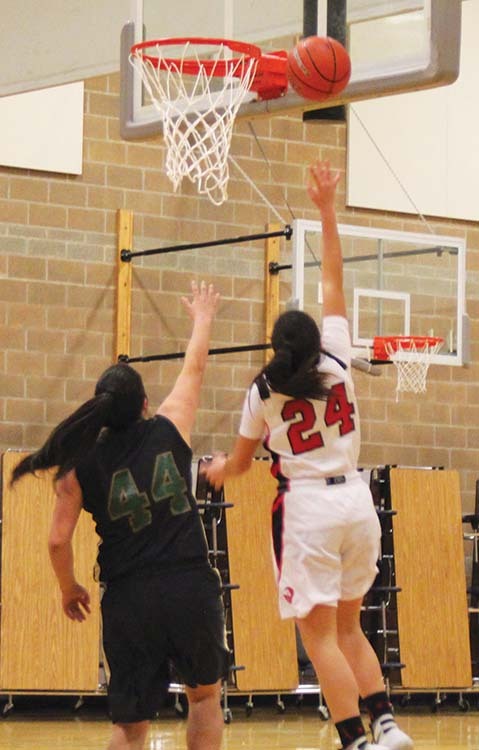 The Lady Hawks next home game is Wednesday, December 7, when they host Chief Kitsap Academy. Tipoff at 5:00 p.m. 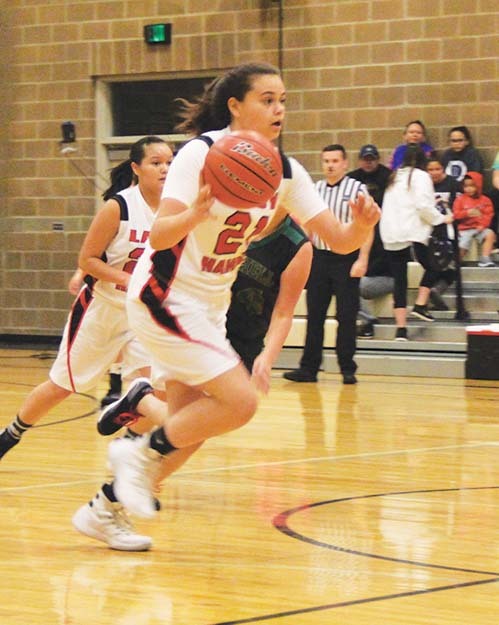 This entry was posted in Sports, Tulalip News and tagged Basketball, Lady Hawks, sports, Tulalip by Kim Kalliber. Bookmark the permalink.